Recently, I mentioned that I’ve been talking to a lot of people who are Vegans. Because they all seem to feel so much better, and point out how eating animal protein really is not good for us or the environment, we are exploring this option. Although, I’m not sure how it fits in with the Whole 30 and the Plant Paradox program. (Actually, I know it doesn’t really fit at all.) Some of the approved foods in the Eat to Live program are really a departure from both Whole 30 and Plant Paradox. Therein lies the problem. While we want to continue to get healthier, it’s hard to balance every program we’re learning about. So with this post, I am highlighting a recipe that I tweaked from a blog post I read about last week. It has Gluten Free Oats, ( which are not allowed on either Whole 30 or Plant Paradox), but it’s a great choice for someone who is mainly concerned with being Gluten Free. Needless to say, Ed won’t eat this. He is concerned about what he’s read about how some Gluten Free products have been processed on equipment that may have been used for products that contain gluten. He’s not about to take any chances. I can’t blame him, but I figured I’d try it, since I don’t have the health restrictions he has. I’ve stopped eating eggs, and I’m looking for other options! I tried this a couple of times and find it very satisfying! (And I’m happy to say, I didn’t experience any stomach problems! Place all ingredients in bowl and mix well. Cover and refrigerate overnight. Garnish with sliced strawberry and blueberries, if desired. The second salad was the Tuscan Kale Salad. (This was Ed’s choice.) It contained radicchio, carrot, radish, broccoli, apples, and dried cranberries with poppy seed vinaigrette. Since his primary focus is to be sure it was gluten free, he placed the order exactly as it was described on the menu. Both salads were delicious! We started talking about various things when the entrée arrived, and I’m sorry to say we were so distracted, I forgot to take pictures of the main meal until we started eating it! Oops again. I have had that happen a number of times during the start of this blog. Especially when eating out. Sometimes, if the food take a while to arrive, we get so hungry, we dive right in. But I will keep working on taking more photos and explaining how easy it can be to have great compliant meals at home and away. So please, stay tuned for more to come. And enjoy our journey as you navigate your own! It’s been a busy week or two as I am adjusting to this new site. I have made a few tweaks, but there are so many more I plan to do. Even adding pictures is turning out to be a challenge. But no worries, I’ll figure it out! Since I am off to Richmond, VA this afternoon, I am somewhat pressed for time, so I am posting a side dish I made recently. What I especially like about it, is that it is quick and easy, as I mentioned in the title. It is one of those dishes that can be paired with fish, meat, or chicken. “What the Health.” She said that after watching that documentary, she immediately became Vegan. Wow, that’s what you call having an impact! I have managed to watch a small part of it, but intend to watch the rest soon. In the meantime, I encourage you to increase your intake of vegetables–especially the green ones! Everyone keeps referring to them as the Superfoods. We all want to lead healthier lives, so this is an easy way to make that happen! Heat oil in large pan till hot. Add onion and sauté till it starts to get translucent. Stir occasionally. Add garlic, stir to combine and let cook another minute. Before serving, squeeze lemon juice over kale, if desired. Thanks for checking us out at this new site. I’ll submit a new post soon! Have a great weekend! Before starting the Plant Paradox program, I loved cheese. In fact, I’d say I loved everything dairy. Several years ago, the first specific eating program my daughter introduced me to was the Ketogenic Diet. At first, I thought she was going to kill herself (and me) by eating so much fat. (The program is all about eating high fat, medium protein, and a very small amount of carbs.) I was amazed about how well I felt after just one week following the program. I felt more energy, less brain fog, and my memory seemed to be better than it had ever been! But the level of cholesterol made me very nervous. I read various other books claiming that one shouldn’t worry about the actual cholesterol numbers, but it still made me uneasy. In any event, this blog has me focused on doing the best we can with the information that is currently available. I think there seems to be a lot of sense in what Whole 30 and the Plant Paradox is promoting. Since Ed has experienced so much improvement in his health, (especially since he has almost eliminated heartburn), I think this is a step in the right direction for us. 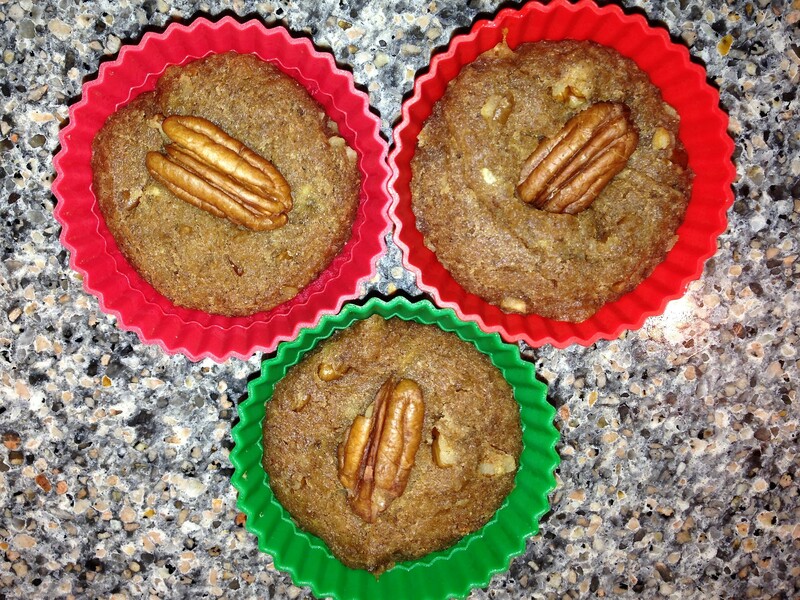 To maintain our healthier diet, and make it tasty–I keep trying and adapting more recipes. Going back to the topic of dairy for a second. I loved cow’s milk products–Cheese, Ice cream, Yogurt! Oh MY! But on the Plant Paradox program–those products from most American cows are off limits. I have slowly started to branch out and try alternative products. Coconut milk yogurt is actually quite tasty! I was amazed how good Buffalo mozzarella cheese is. And although I was NEVER a fan of goat cheese, I found a product at a farmer’s market recently that had blended goat’s cheese with blueberries. It’s fabulous, and not too strong tasting. So I came up with a simple recipe using goat cheese, great for lunch or dinner. Another one of those “no recipe” recipes you can modify to your liking! 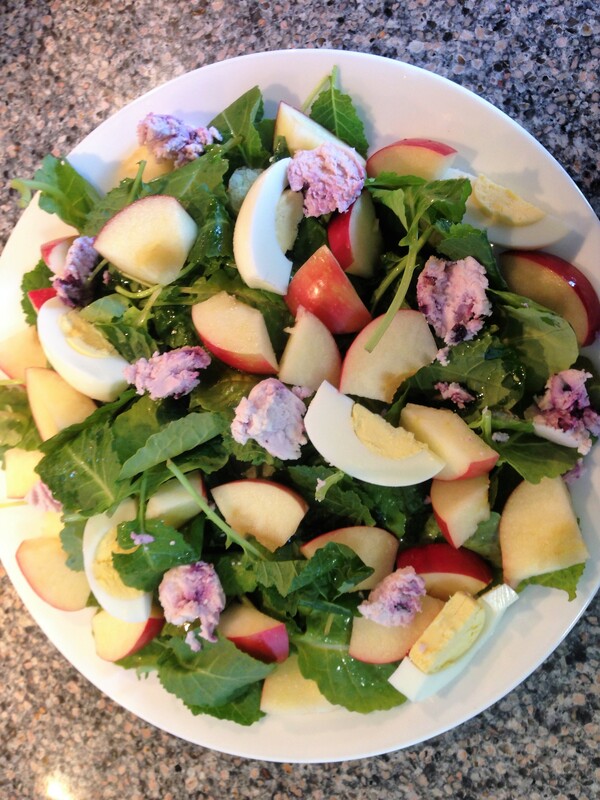 Salad Greens with Apple slices, Sliced hard boiled egg, and Blueberry Goat cheese. 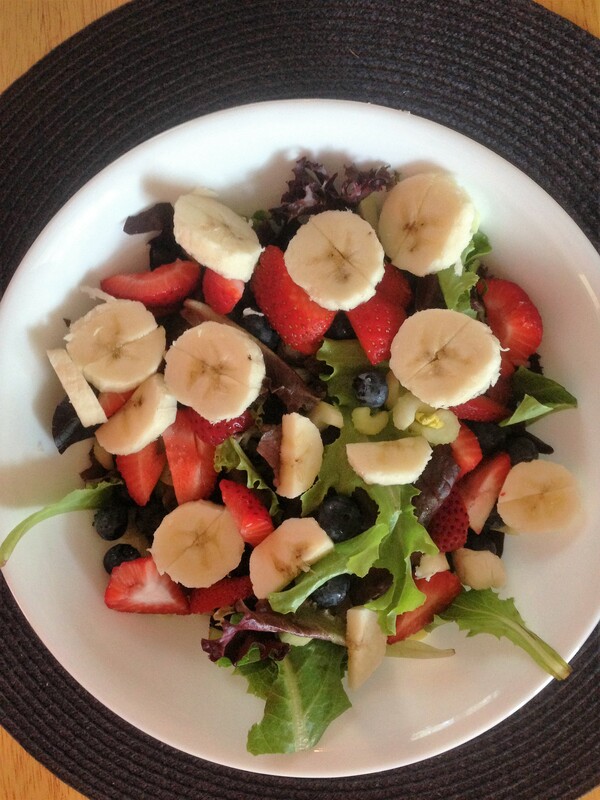 (I used EVOO and Balsamic vinegar to dress this salad, but you can add whichever you choose!) You can add chopped nuts, too! Many years ago, I was introduced to Indian food. I loved it! Having grown up eating some kind of meat, fish or chicken with every meal, it was hard to imagine a meal with NO animal meat–that is, until I learned about Indian cuisine. Wow! I never knew vegetables could taste so good. My mother never made anything like this! What a delightful experience when vegetables are prepared in the Indian style. I found out that there are about 40 different kinds of lentils! The only time I’d eaten lentils was in lentil soup! (I’ll go into more detail about lentils when we introduce them in Phase 3 of the Gundry program.) How things have changed for me from that first day forward! While Indian food isn’t a favorite of Ed’s, he does enjoy it on occasion. (Especially since it satisfies so many of our new dietary restrictions.) This dish is usually made with cauliflower and regular white potatoes. (It was also one of my daughter’s favorite Indian meals, so I made it regularly.) I especially love the smell and color of so many of the Indian spices. They are so healthy, too! Turmeric, in particular. Since white potatoes are not on the Plant Paradox program, I decided to try something a little different. I substituted sweet potatoes for the regular ones. It actually adds a lot to the presentation, as you can see from the photo. Normally, Indian food is served with bread (naan) and/or rice–both of which we are not currently eating. Naan is not gluten free, so it’s off the menu as it is. But in Phase 3 of the Plant Paradox program, we are allowed to introduce Indian Basmati rice (in very limited amounts). We are not quite at that point, so when I made this dish, I spirialized some carrots. (But I didn’t show them in the photo since I wasn’t happy with the effect. Too much orange, lol.) Soon I plan to include Basmati rice to our menu, which will add a wonderful texture and taste. In the meantime, I do use Riced cauliflower, which is okay for many dishes–but not very appropriate for this cauliflower and sweet potato meal. Put Oil in large sauté pan, and cook onion till slightly translucent, then add garlic and stir. Cook a minute or two then add the ginger. Stir and cook a minute or two, then add the spices. Stir mixture and let cook again for a couple of minutes. Then add the cauliflower and sweet potato pieces. Stir well to mix all the ingredients together. 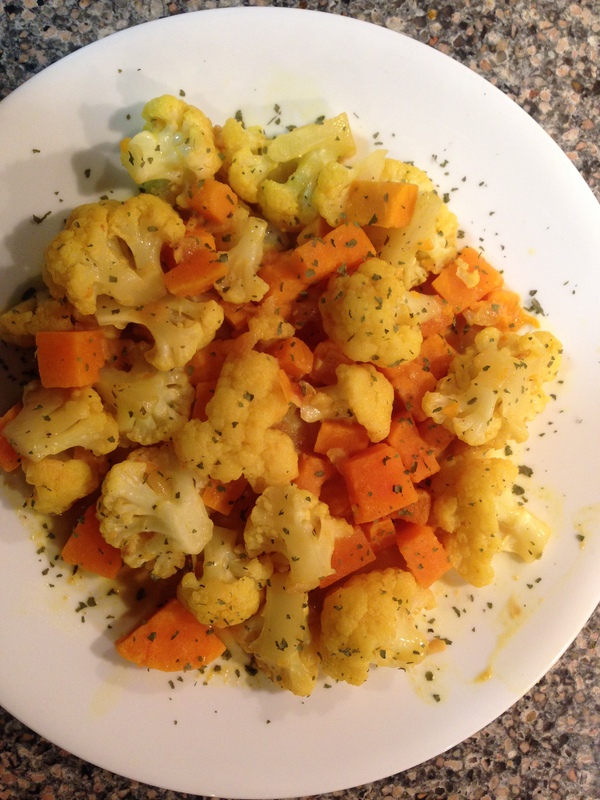 Cover and let cook on medium heat till cauliflower and sweet potato are tender (approximately 15-20 minutes). Spoon over rice (if using), and garnish with coriander leaves, if desired. Several years ago, my daughter and I used to go to a nice little restaurant in Providence (which isn’t there any more, unfortunately), called Grappa’s. They had the best thin crust pizza I’d ever eaten. (I think it was even better than Al Forno’s which most people know very well.) 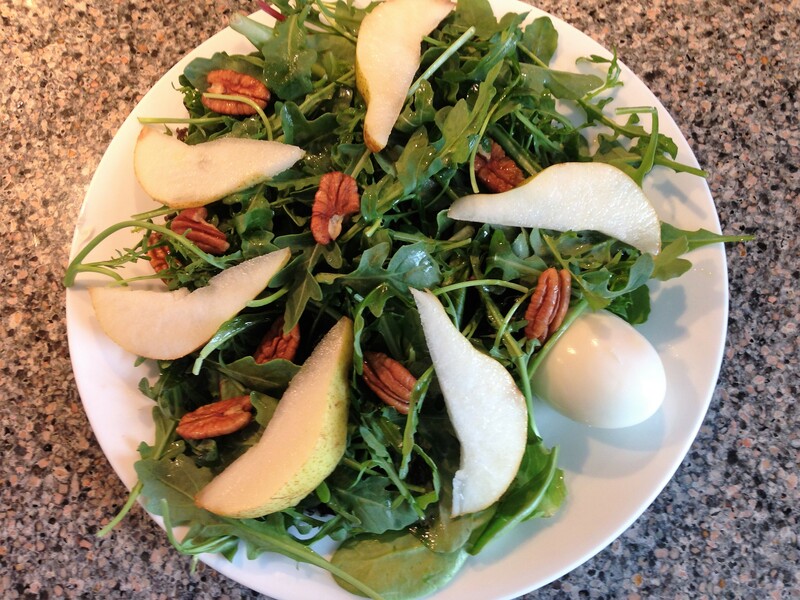 On the menu was an arugula salad with pears. It was fabulous. I don’t remember if they put nuts in the salad, or what the dressing was, but the pairing of pears with the arugula was heavenly. So I recreated my version of the salad and still think the combination is wonderful. Whole 30 and Plant Paradox compliant! Although I have been resisting the idea of being a vegetarian or vegan, Ed is ready to give it a try. (Easy for him to say–he’s not doing the cooking!) Maybe it’s because I was brought up in a meat & potato kind of household, and so I can’t imagine not having some kind of protein with most meals. I am working on changing my thinking, since Dr. Gundry (and others) claim we can get enough protein from other sources. (And besides that, we really don’t need as much protein as we have been led to believe!) So I am on a mission to incorporate more “meatless” meals in my repertoire. 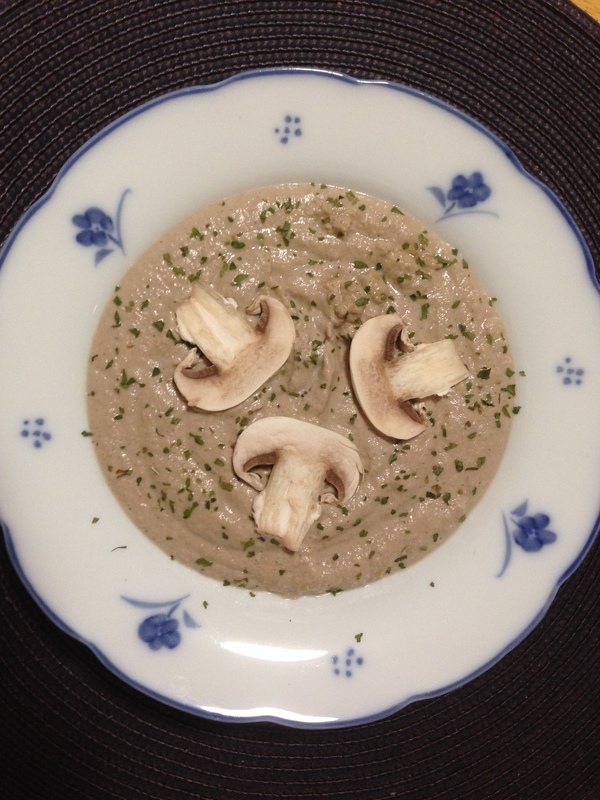 I was looking through the recipes in the Plant Paradox book and came across Dr. Gundry’s recipe for Raw Mushroom soup. While it seemed fast and easy, I didn’t like the idea of it being raw. I knew that sautéing the onions and mushrooms would bring out more flavor. So that is how it started. The end result is pretty amazing, if I do say so myself. Ed agreed wholeheartedly, so that means–it’s a “keeper!” Paired with a salad, this makes a great light lunch or dinner. Heat oil in large sauté pan. Add onion, and cook a few minutes till it starts to soften. Add chopped garlic and cook a couple of minutes longer. Add sliced mushrooms, and stir. Cover pan and let cook a few minutes till mushrooms start to release their juices. Add hemp seed hearts, pecans, salt, pepper, and thyme. Stir well, cover pan and let cook on medium heat about 5 more minutes. Transfer mushroom mixture into blender (or food processor), add coconut cream and water and blend till smooth. (Can add additional coconut cream/water if a thinner consistency is desired.) We liked it thick! Garnish each serving with a few sliced mushrooms and parsley (if desired). While my last blog showed a wonderfully refreshing salad with fruit as an idea for breakfast, I have to admit–having greens morning, noon, and night can get old pretty quickly. For a change, I told Ed I’d experiment with Dr. Gundry’s muffins. I made the first batch of muffins, for the most part, according to his recipe and they weren’t bad. (Unfortunately, there are no pictures. They disappeared before I could get my camera!) In Gundry’s book (The Plant Paradox) he also has a unique recipe to make a muffin (for one) in a mug. Originally, I made it with Vegan eggs, since Ed also wants to avoid eggs. It didn’t turn out so well, so I went back to the drawing board, as they say. I decided to try the other recipe in the book that is baked in the oven in regular muffin tins. That is what this recipe is based on, with several changes, of course. I intend to make these with lots of variations, so you’ll hear about them again (and again, and again)…. Ed really liked the idea of having something different–especially on the weekends–and he REALLY liked this version! Bake 350 degrees for 22-24 minutes. Let cool at least 20 minutes before serving. When we first started with the Plant Paradox program, green smoothies were recommended and they were easy to prepare. The beauty of making them is that you can combine whatever ingredients you have on hand, and there is so much variety to the various greens available. (We did add a little fruit and compliant sweetener after the 3 day cleanse period, which I think added a lot to the flavor.) But after a while–well, let’s be honest. It gets boring to eat the same thing every day. Especially when you’re just DRINKING … and there’s no real chewing! Great for breakfast, lunch, or a nice light dinner! You can easily add some grilled chicken or shrimp if desired.